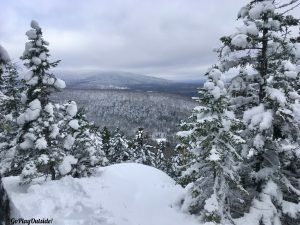 The First Snowshoeing Trip of the Season: Little Moose Mountain – Go Play Outside! On Saturday, December 1st, Frosty and I drove up to Greenville. 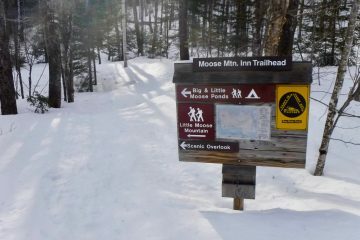 We went to one of our favorite spots, Little Moose Mountain (formerly Little Squaw Mountain). 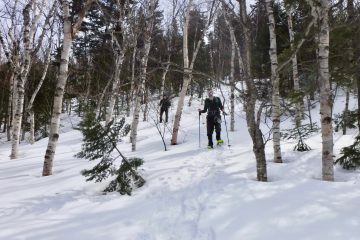 We frequently snowshoe here, and we always enjoy it. The First Viewpoint on the Trail up Little Moose Mountain Comes Early. This Would Be a Great Place to Picnic in the Summer. The day was overcast, but mild. The temperature starting out was 27 degrees. It was beautiful in the woods. 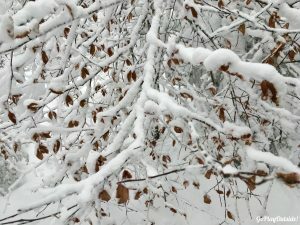 The last snowfall was still clinging to the trees. Our last trip here was in the late March or April. There were a few trees down in or across the trail, especially in the beginning. 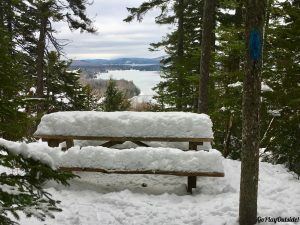 One of the nice features of this trail is the several viewpoints overlooking Moosehead Lake and Big Moose Mountain from different directions. One of these viewpoints in a small clearing was blocked by a fallen tree as well. The trip was the earliest in the season that Frosty and I had ever been here. 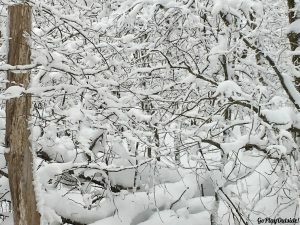 It was interesting to see so many of the rocks peeking through the blanket of snow. Later, these rocks are snow mounds. Some rocks that the trail goes over had melted out through the snow causing a few bare spots. But, they were easy to step over. Another aspect that was different today than on our previous trips here was that nearly the entire trail was packed down. 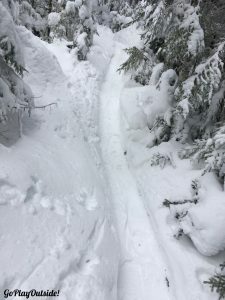 In the past, about a third of the trail has been packed down. 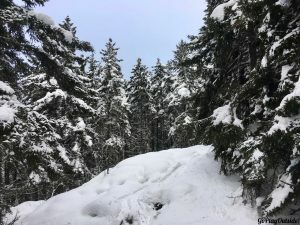 On some of our past trips after snow storms, none of the trail was broken. I am accustomed to breaking trail here. It made this trip seem a little too easy! The point where the previous visitor(s) turned around was before our usual turn around spot. A bunny had tried to break trail for us on this section, but his work was spotty. We headed up the short, but steep section where the tracks stopped. 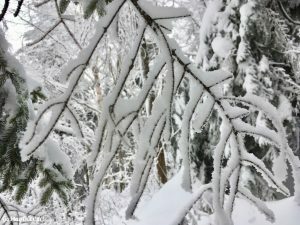 My snowshoes slid down with each foot plant sloughing off a good portion of the snow. The cleats on the bottom of my snowshoes were having trouble digging in. My poles were slipping. I was determined. I slowly fought my way up this section. Each foot plant was attempted repeatedly, until it stuck, and I could move onto the next step. When I got high enough I grabbed the tree at the top and pulled myself up the to the small landing. The grade is much less steep after this part. This little section is only about four to six steps, but it is so steep. This section did make me feel better about the packed trail being too easy. Frosty took the time to get his ice ax out. This helped him get solid leverage to pull himself up. Frosty made it through this section with ease. I could have saved myself some effort, if I had taken the time to get out the right equipment. On the return trip, I sat and slid down that steep section on purpose. Unlike a prior section close by, where I fell and slid down. Frosty walked backwards down this part with his ice ax. 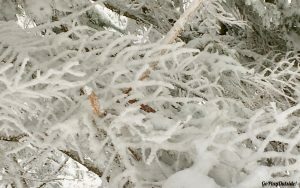 The snow sticking to the sides of the trees obscured some of the blazes. The trail was well packed and familiar, so that eliminated any potential problems. 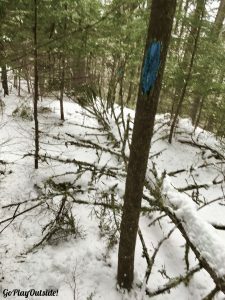 Some trails are hard to follow in the winter. 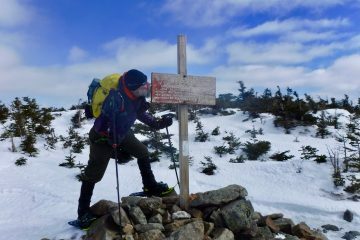 Blazing is done in the summer, usually without a thought to winter navigation. 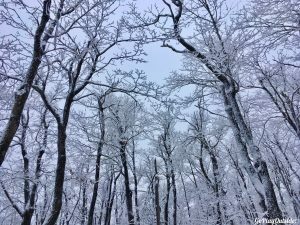 The white blazes of the AT can blend in on snowy trees in the winter. Our trail today wasn’t on the AT. It had bright blue blazes. Another potential navigational problem is if a trail has lots of rock blazes. The rock blazes disappear in the winter. 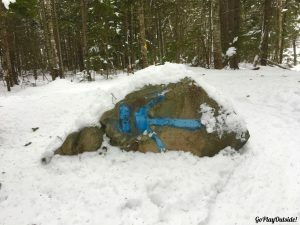 There is one rock blaze on this trail. 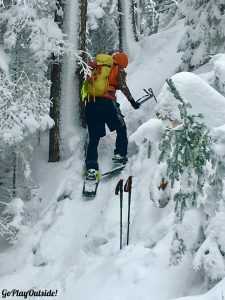 I have only seen it twice while snowshoeing. I saw it today which was very early in the season and on one trip that was very late in the season. But this area of the Little Moose trail has tree blazes nearby, so this isn’t a navigational problem. Several rock blazes in a row could cause confusion. 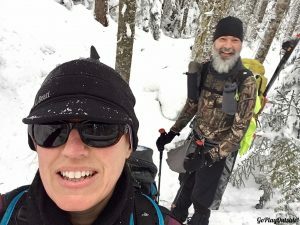 Frosty and I travelled over 4.40 miles today with about 950 feet of elevation gain according to my Garmin watch. We saw tracks from a rabbit, mouse, and small coyote on our walk today.